Before coming to the White House, I struggled, as a working parent with a traveling, busy husband, to figure out how to feed my kids healthy, and I didn’t get it right. Our pediatrician had to pull me aside and point out some things that were going wrong. I thought to myself, if a Princeton and Harvard educated professional woman doesn’t know how to adequately feed her kids, then what are other parents going through who don’t have access to the information I have? If a Princeton and Harvard educated professional woman can’t figure out what to feed her young’uns, can you imagine the yucky stuff kids whose mothers and fathers went to community colleges are putting in their mouths? As a graduate of Rhodes College in Memphis, I now see why it is such a blessing that I don’t have children. What on earth would I feed them—Tootsie Rolls and Coca-Colas? 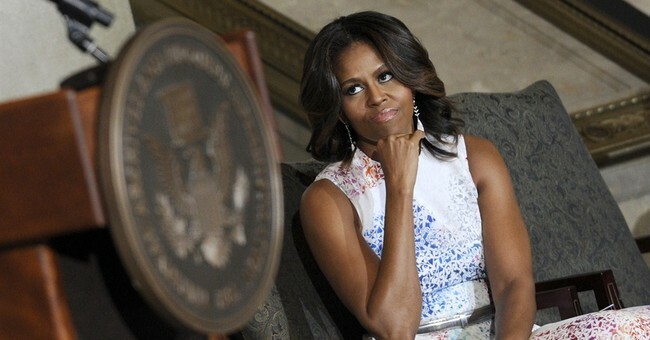 Unfortunately, this highly affluent woman, who was pulling down in excess of $300,000 for a job in hospital administration before moving into the White House, yet apparently couldn’t devise simple, nutritious menus for her own children without an intervention from the family pediatrician (“Have you considered arugula, Mrs. Obama?”) is now trying to tell an entire nation what to feed the children. Perhaps based on her experience of not having the foggiest what to feed Malia and Sasha, Mrs. Obama has reformed the school lunch program in public schools. Unlike previous first ladies, Mrs. Obama doesn’t rely on solely moral suasion (“Just Say No!”) to promote her cause. Not content with encouraging low-income kids to dump taxpayer-bought comestibles into the garbage can, Mrs. Obama worked to expand the school lunch program so that all children, regardless of family income, now are entitled to free school lunches. Maybe Mrs. Obama believes that all parents are as clueless as she was? Apparently, she also believes that instead of mastering the incomprehensible art of menu planning, parents should just surrender the whole project to the federal government. But this is the opposite of what should be happening: the free lunches for everybody program encourages parents not to be responsible for their children’s nutrition. As IWF’s Julie Gunlock has written, greater parent involvement in diet, and lifestyle changes like less television and more sleep are among the keys to reducing childhood obesity. We might also question whether Mrs. Obama has learned enough to be the food decider for a nation. Take, for example, Mrs. Obama’s recent attack on the nutritional properties of the humble potato in the New York Times. The first lady urged that the potato be proscribed for mothers who use benefits from the Women Infants and Children (WIC) program to feed their children. Now, there might be plenty of reforms in order for the WIC program, but banning the nutritious potato isn’t one. Potatoes are chock full of nutrients: potassium (more per ounce than in the banana), vitamins C and B-6, and several dozen anti-oxidants. The Obama Administration’s FDA is also currently issuing new restrictions related to salt consumption, in spite of growing scientific evidence that reducing sodium-intake will not benefit public health. If Mrs. Obama gets something wrong, because she has enlisted government power and not just persuasion, it almost takes an act of Congress to provide relief. Indeed, Republicans—much to the first lady’s chagrin—are trying to offer waivers to school districts that can browbeat the kids into eating Mrs. Obama’s food selections. Left to their own devices, school districts and parents more are likely to come up palatable and nutritious meals than Mrs. Obama and a flock of bureaucrats. I hope you won’t think I am sexist when I say that most mothers can learn to assemble healthy menus for their children. (Fathers can, too, by the way.) When my sister was teaching in a public school in California, she invited a couple who had a large family (I believe there were ten children) to come every year and speak to the class about money management, which the couple did very successfully. They talked about what groceries they purchased and even about picking up free potatoes (yes, the potato again) when farmers opened their fields to gleaners. This was a family that ate well and saved money. When normal obligations are left to the family, the family can learn to cope. If a family is eating too many potatoes, it can just cut down. It’s that simple. We’re seeing what used to be regarded as everyday activities of life—learning what to feed one’s children—turned into a complicated process that must be managed by the federal government. The irony is that the experts often get it wrong and leave the rest of us with a complicated mess on our hands. Thus it was that the Ivy League educated woman who couldn't figure out what to feed her two children who thinks that her husband and a band of like-minded experts can reorganize the nation’s health care system without anyone paying a price. Mrs. Obama's "I couldn't feed my kids and I went to Harvard" betrays a condescension that is endemic in our new ruling class.